The phenomenal pop culture haven that is Ernest Cline’s novel, Ready Player One did not wait too long for it to receive a film adaptation. Who else would be better to produce a big budget 80’s nostalgia ride then the guy who created most of our childhood cinematic memories, Steven Spielberg. A match made in heaven, reading the book it seemed unfilmable with the amount of pop culture references and the amount of CGI needed to fulfill the aesthetic of the OASIS. I have finally got round to watch one of the most ambitious films of the year from a book I have very recently grew very fond of. Ready Player One is set in the future where the majority of the poverty stricken population live within the virtual reality world called the OASIS. The OASIS was created by developer James Halliday (Mark Rylance). Halliday passes away and after his death a video message is sent out to every OASIS user that he has hidden three keys within the virtual world. The person that finds the three keys will inherit a huge fortune and complete control over the OASIS. The film follows Wade Watts (Tye Sheridan) known as his avatar name Parsival along with online friend Aech, Sho, Daito and his virtual crush Art3mis (Olivia Cooke). 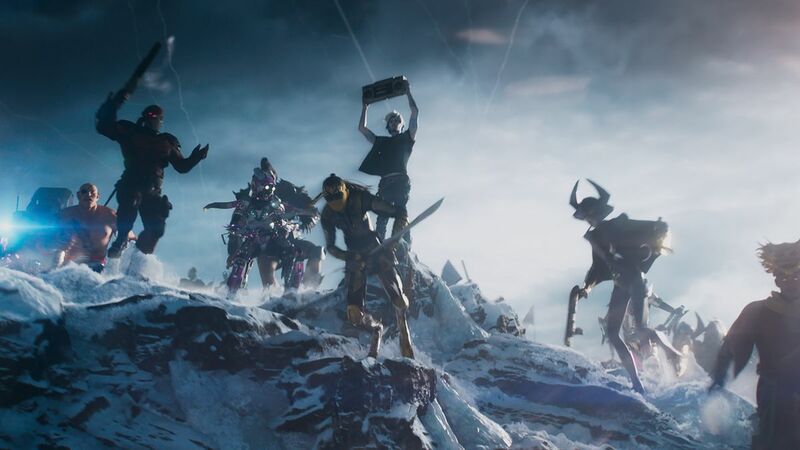 All team up to try and find the three keys but before that, they must overcome the might of the evil corporation IOI, headed by Nolan Sorrento (Ben Mendelsohn) who attempts to use their wealth and power to cheat to win the easter egg hunt. As someone who has recently read the book and fell in love with the story, the literature trip into an immersive virtual nostalgic utopia, the novel is a real joy to read. For any fans of the book, the film is very different. I know this is always the case but Ready Player One is a perfect example of how a story has to change for particular mediums. Once you can distance yourself from the book when you watch the film, the better. The film provides a completely different adventure and still provides the same immersive nostalgic experience as the novel does. One of the biggest issues with this film would of been the cinematic references that the novel has by the truckload. It would of been impossible economically to buy the licenses for each individual film, book, comic and video game mentioned in Cline’s book. This warrants Warner Bros to raid their own backlot and the film is full of blink and you miss it references. This is a great compromise because you get some fulfilling cameos from horror icons such as Freddy Kruger, Jason Voorhees and Chucky to other loved cinematic characters such as Iron Giant, King Kong and the T-Rex from Jurassic Park. I’m sure I missed hundreds of references but that warrants a re-watch which I would happily do. Spielberg has a lot of power when it comes to iconic characters and you can definitely see his involvement with just how much licensed characters they were be able to get. A lesser director may of got a lot less film references shoehorned in. Ready Player One also had the huge challenge of recreating the OASIS, the physical embodiment of the human imagination. The endless possibilities of eternal adventures and complete wonder. However, it was able to recreate this immersive feel of adventure and magic. This has got to be given credit to ILM (Industrial Light and Magic) and Steven Spielberg. Spielberg invented the modern adventure in modern cinema. Spielbergian magic is littered throughout this film, a director that has given us Indiana Jones, E.T, Jurassic Park and Jaws, this is the perfect film for Spielberg. The film constantly is moving from place to place. The camera moves along with the action with a frenetic pace. Your brain ingestes all of this wonder, adventure and movement so fast it sometimes can become too much and overwhelming, however it does produce a great representation of the thunderous onslaught of nostalgia, magic and action that lives within the OASIS. One of the best scenes in the film is the Shining sequence. Acting as a love letter to the Kubrick classic, when the gang are trapped within the Shining it is fun to watch the most famous scenes within the film being created within the OASIS and within the confines of a 12 rating. At times it is surprising of how it kept its 12 rating due to the violence, suggested sexual content and swearing. The world of the Shining is recreated perfectly with a fine and intricate detail. The worlds of the OASIS are brimming with such visual beauty and demonstrate the amount of care and precision that has been put in this film. The visual production is spectacular and provides a gleaming example of how far visual effects have come if you compare it to early CGI heavy films such as Tron (1982). Ready Player One is full of visual spectacle, it is all about the OASIS and with that it must sacrifice character arcs and depth. The main characters are not fleshed out as much as they should and investment into them is minimal. The relationship between Art3mis and Parzival feels rushed and while there are moments which show the potential of these characters it is somewhat muted so the real main character can be centre stage, the OASIS. Mark Rylance as James Halliday was great, Rylance playing the bumbling and introverted developer shows the talent of that man with his previous roles of Russian spy and BFG being completely different. I would of like to see more of the characters being fleshed out and demonstrate a clearer motive and I wouldn’t of minded of seeing less of the OASIS for that simple trade off. Ready Player One is a pure Spielbergian magical adventure that has been injected with steroids. The pacing of the film is so fast, I feel like I’ve missed a lot of the film and after this review I may have to go back and watch it to try and see if I missed anything. Even though completely different from the book, Spielberg was able to create the same experience. As I was watching it I was smiling at the references and was constantly fed with spoonfuls of nostalgia. No other director could of helmed this film and made it a fun immersive experience. The plot is simple, the characters are standard but the visuals and adventure truly make this a complete blockbuster experience that should be viewed on the biggest screen and using the loudest speakers you can find. A modern Spielberg classic, Ready Player One shows the allure of cinema of still being able to provide magic and wonder. Even though the film doesn’t have the heart of some of Spielberg’s previous films, Ready Player One is a brilliant erratic ride into a nostalgic utopia that will make you smile and experience something unique to cinema. Cinema enable a visual immersive experience of being able to sit down and be taken on an adventure to anywhere you want to go. Ready Player One is a brilliant adventure that is visually stunning and did the novel justice.